Starting from Apr 1st 2018, DP2000/9000 Series have been discontinued. As a possible substitute, please check out the DPPT Panel Meter or CNPT Controller for details. 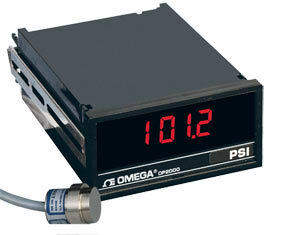 OMEGA ® DP2000 Digital Indicator/Controllers bring you a new world of versatility. A universal 1 /8 DIN case houses your choice from thousands of configurations. Choose any combination of Display Type (LED or LCD), Operating Power, Input Type and Range, Analog Output and Digital or Control Outputs. OMEGA will supply a fully burned-in and tested OMEGA ® DP2000 to suit your needs. Versatility is second only to reliability in the OMEGAROMETER series.